Emerald by the Sea is set atop the highest point on the island and offers breathtaking gulf views and jaw-dropping sunsets. 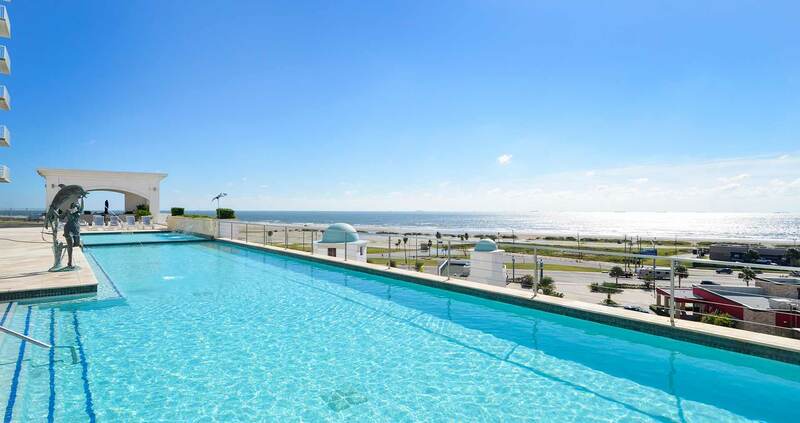 Emerald Galveston condos for rent are a classy elegance for the sophisticated vacationer, loaded with upscale amenities. Emerald sits on Galveston’s East End, behind the Seawall and across from Stewart Beach and a stone’s throw from Poretto Beach. The location is ideal for those that want to be in the heartbeat of Galveston. You can walk to the shopping center, restaurants and various beach rental spots. Emerald is just a short bike ride away from Downtown Galveston or The Historic Galveston Island Pleasure Pier. There are so many amenities at Emerald though, you may not want to leave. Emerald offers a 6th floor terrace with a stunning pool, game room, movie theatre, fully equipped gym, wine room and several lounge areas. That’s in addition to the oversized Galveston condos for rent with full kitchens, floor to ceiling windows, huge outdoor balcony and Emerald’s own bar & grill. The views from the units are so spectacular it looks as if you’re floating on water. Picture perfect, panoramic full gulf views from every window your entire stay. If you decide to venture out, then you have plenty to keep you busy. Pop over and take a ferry ride to Pointe Bolivar and check out the other side of the island. Visit Yaga’s café for some fun food or The Black Pearl for seafood. Then people watch or sightsee around Old Galveston Square. You can play outdoor chess, take a carriage ride or even check out Pirates: Legends of the Gulf Coast for an interesting bit of history. If you get adventurous, then Seawolf Park offers up incredible fishing and a 360 degree view when the sun sets. Take a historic homes tour, visit Bishop’s Palace or go shopping at The Strand. You can check out a show at The Grand, watch a film about the Great Storm at Pier 21 Theatre or peruse the various museums. If you don’t want to go far, no worries, there are shops and restaurants right outside your front door you can walk to. No matter what you chose to do Emerald Galveston condos for rent are the perfect location for an all access pass to the island. The best part is there’s tons to do in walking or biking distance. Emerald is the perfect balance of relaxing leisure and island excitement.